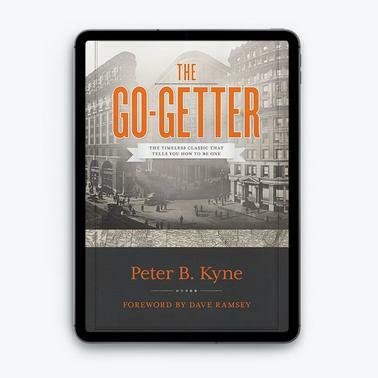 Ever since its first printing in 1921, The Go-Getter has inspired employees and entrepreneurs to take initiative, increase their productivity, and excel against the odds. In this book, Bill Peck, a war veteran, persuades Cappy Ricks, the crusty founder of the Ricks Logging & Lumbering Company, to let him prove himself with a sales assignment that everyone knows can only lead to failure. When peck beats his quota, he earns the ultimate opportunity and the ultimate test: the quest for the blue vase. Drawing on such classic values as honesty, determination, passion, and responsibility, Peck overcomes nearly insurmountable obstacles to find the vase and launch his career as a successful manager. In a time when jobs are tight and managers lack the time for mentoring, how can you maintain positive energy, take control of your career, and prepare yourself to ace the tests that come your way? By applying the timeless lessons in this compulsively readable parable, employees at all levels will learn to rekindle the go-getter in themselves. A classic piece of motivational fiction. The book tells the story of a crippled army veteran who parlays a 'never say die' spirit into a successful career. ... It offers a bracing, no-nonsense kind of motivation. Latter-day motivators like Kyne encouraged self-reflection and a critical look at one's character. Since my first reading of The Go-Getter 20 years ago, I have considered it a jewel. Every person who reads [it] will be inspired to take charge of their work, their career, and their future. It's a powerful story that illustrates what you can accomplish when you commit to being gung-to about your job. coauthor of The One Minute Manager & Whale Done!